The new Chevrolet Cruze delivers almost everything we'd expect in a good compact sedan. It's the best small car GM has offered in North America in decades, by a substantial margin. Launched as a 2011 model, the Cruze replaces the sturdy but boring Cobalt, and it's a great leap forward in technology, features and appeal. The Cruze was developed jointly by GM tech centers in Asia, Europe and the United States to battle in the most crowded part of the passenger-car market, with excellent new competitors like the Hyundai Elantra and Kia Forte, the best Volkswagen Jetta in years, and perennial leaders like the Honda Civic, Mazda 3, and Toyota Corolla. These are not necessarily competitors a newcomer wants, but the Cruze holds its own with all of them, and surpasses many in key areas. Cruze is conservatively styled, to be sure, but in our opinion it's a well designed, handsome car. Its interior is one of the roomiest in its class, with acceptable space for four adults, and it's also one of the nicest. By the quality of materials, fit or function, it surpasses nearly all its competitors. Its trunk is also one of the largest in a compact sedan. The 2011 Cruze is offered with a choice of two adequately powered engines: A 1.8-liter four-cylinder and 1.4-liter four-cylinder with a turbocharger. Both the manual and automatic transmissions have six speeds, which is rare in this class. The automatic offers some high-tech features that help conserve fuel. Across the line, the Cruze averages some of the best EPA mileage ratings among compacts. Yet if there's an area where Cruze falls below the benchmark, we might summarize it this way: Buyers seeking maximum acceleration in their compact sedan should probably consider one of those competitors. In nearly every other respect, the Cruze runs near the head of the pack. Its steering is powered by electricity to save fuel, and its sharp, with decent feel. Ride quality is outstanding, yet the car is nimble, balanced and handles exceptionally well. The Chevrolet Cruze might be the smoothest, quietest compact offered in the United States. For about $17,000 with destination charge, the base Cruze LS comes nicely equipped, with as much horsepower as the higher-trim models, air conditioning, six-speaker audio with standard XM satellite radio and power windows and locks. For $1,900 more, the Cruise LT adds the turbocharged engine, automatic transmission and a few more features, and it opens the car up to a wide range of options. No matter which Cruze a buyer chooses, it comes with the most standard safety features in its class, including advanced electronic stability control, ABS, and a full compliment of 10 airbags. There are knee-protection airbags for front passengers, side-impact airbags for rear passengers, and head-protection curtains with rollover deployment. Every Cruze comes with GM's OnStar telematics system, including a six-month subscription for automatic accident response and other services. The Cruze Eco delivers the best fuel economy. Its active aerodynamic features make it slipperier through the air, and it weighs more than 200 pounds less than other models. Its EPA rating of 42 mpg Highway is the highest for any conventionally powered car in this class, and higher than most subcompacts. At the top of the range, the leather-lined, feature-laden Cruze LTZ offers technology that pushes the envelope for what many still think of as an economy car. It's available with a full-feature navigation system with 40-gigabyte hard drive, rear park assist, concierge services, premium Pioneer audio and remote starting. A loaded LTZ will crack the $26,000 barrier, however, at which point the Cruze makes less sense for many buyers, unless they very specifically seek a smaller, fuel- efficient car that's loaded with the latest features. For that kind of money, the alternatives include larger, very nicely equipped midsize sedans such as the Ford Fusion, Honda Accord, Hyundai Sonata or Nissan Altima. In final analysis, even import-inclined compact buyers should have a look at the Cruze. It has moved Chevrolet near the tip of the small car spear for the first time in memory. The 2011 Chevrolet Cruze is available in four model levels, with a choice of four-cylinder engines and either a 6-speed manual or 6-speed automatic transmission. The Cruze LS ($16,275) is powered by 1.8-liter inline four delivering 138 horsepower and 125 pound-feet of torque, with a standard 6-speed manual. The LS comes with plenty of features, including air conditioning, power windows, power door locks with remote keyless entry, and six-speaker audio with single CD, an auxiliary jack and XM satellite radio. The standard wheels are 16-inch steel. The 6-speed automatic is optional ($925). The Cruze Eco (18,175) is optimized for fuel economy. It's powered by a smaller, 1.4-liter turbocharged engine that delivers the same 138 hp as the base engine, with an increase in torque to 148 lb-ft. It's lighter than other Cruze models, with aerodynamic aids that make in slipperier through the air, and low-rolling-resistance tires on 17-inch alloy wheels. The Eco is rated at 42 mpg highway with the manual transmission, and 37 mpg with the automatic. The Cruise LT ($18,175) is powered by the same frugal turbocharged engine, with the automatic transmission standard. It also adds painted power side mirrors, and it can be equipped with a lot more options than the base LS. Foremost is the 2LT package ($2,500), which adds a six-way power driver seat, leather seating surfaces, heated seats, leather-wrapped steering wheel and shift knob, Bluetooth phone connectivity, steering-wheel mounted audio controls, remote vehicle start and 16-inch alloy wheels. The Cruze LTZ ($21,975) is the high-zoot model, with the turbo engine and automatic transmission. It comes standard with the contents of the 2LT package and adds even more features, including automatic climate control, an auto-dimming rearview mirror, ultrasonic rear-parking assist and 18-inch alloy wheels with four-wheel disc brakes. The Cruze comes standard with more safety features than any car in its class, starting with 10 airbags: front, side-impact and knee-protection airbags for front passengers, rear side-impact airbags and full cabin head-protection curtains with rollover deployment. GM's OnStar telematics are standard, with Automatic Crash Response and other services free for six months. Other standard safety features include Stabiltrack electronic stability control, anti-lock brakes (ABS), front seatbelt pretensioners, daytime running lights (DRLs) and the federally mandated tire-pressure monitor. The Chevrolet Cruze compact sedan isn't likely to wow anyone with neck-craning looks. Nor will it inspire anything close to revulsion, or even distaste, in its beholders. Cruze styling is conservative, but it's also quite handsome and nicely proportioned. And large, as compact cars go. Measuring 181.0 inches bumper-to-bumper, on a wheelbase of 105.7 inches, the Cruze is at least slightly larger car than nearly all of its competitors, including the Honda Civic, Toyota Corolla and the all-new 2012 Ford Focus. By wheelbase and width, the Cruze is less than two inches smaller than some midsize sedans, including the Ford Fusion. Many of the Cruze's hidden design features have been adapted from larger, typically more expensive cars, intended to reduce the noise and vibration reaching those riding inside. There are nylon baffles in hollow portions of the steel body/frame structure, and sound-absorbing foam that expands in various cavities when the paint is baked on. The doors have triple sealing gaskets, with fiberglass liners that provide another barrier against water, airflow and noise, and they slam shut with a precise, satisfying THUNK. In general, the Cruze is more angular than other recent Chevrolet sedans, including the popular Malibu. Its front end mimics the Volt plug-in sedan, no doubt deliberately, with a prominent Chevrolet Bowtie logo. The headlight housings are large, sweeping upward and around the front edges of the car. The Cruze Eco is a slightly different beast, because it's designed to be Chevrolet's conventional-engine fuel economy leader. The differences start with 42 steps intended to trim weight, right down the size and location of welds in the body. As a result, the Eco tips the scales at 3,009 pounds, or 214 pounds less than the mid-level Cruze LT. The Eco also adds a host of aerodynamic tweaks, including some adapted from the Volt plug-in. These start with active grille shutters that close at higher speeds, blocking much of the grille surface when the cooling demands of the engine allow it, and smoothing air flow over the front of the car. The Eco also sports a lower front air-dam extension, plastic panels that cover large portions of the underbody and a carefully crafted rear spoiler. It's finished with low-rolling-resistance tires on specially designed rims. That means a bit less braking performance or grip through the corners, but it also means less friction when the Eco is cruising along for better fuel economy. The new Chevrolet Cruze sedan continues GM's steady trend toward world-class passenger space. Overall, we'd rank its interior among the very best in compact cars, particularly measured by finish, material quality and overall quiet operation. Space, too. There's a lot of it inside the Cruze, with ample dimensions in most directions. This compact delivers an excellent balance of quality, coziness and space to breathe. We think the Cruze is at the top of the class for the look, fit and feel of the materials inside. This is a Chevrolet? The seams join with tighter tolerances than those in some cars a class or two above. The textiles and plastics are rich, appealing and nicely grained, and the metallic trim looks good. The fabric used for the door inserts matches that used on the seat cushions, and it flows from the doors across the bottom of the dash. It's unique, and visually inviting. The optional leather upholstery is thick, yet supple, and stretched tightly over the seats. The headliner is form fit with a soft, sturdy knit material, and it's only the outer layer of five in the roof's insulation. About the only thing not up to snuff is some hard plastic at the bottom of the door pillars, and while no one will look at it much, it's stands out as sub-par because everything else is so nice. The front-seat adjustments in the Cruze allow occupants to find the right spot quickly and easily. The optional power controls for the driver are just as easy to use, and the tilting seat bottom has more range, from steep angle to nearly flat, than one finds in some luxury cars. There's plenty of fore-aft travel for drivers well over six feet tall, with even more front headroom. If anything comes up short, it's width. Published figures rank Cruze at the top of the class in front hip room, but the center console is on the wide side. Larger drivers who keep their legs slightly splayed may find their outer thighs or knees rubbing on the dash or door panel. You can drive better with knees closer together, anyway. The steering wheel is thick and grippy; with the optional leather, it feels great in the hands. The wheel tilts and telescopes in all models, though the redundant audio controls on its right spoke are available only on higher-trim Cruze variants. The cruise-control switches on the left spoke are the best in the business. There's an on/off master switch and a big cancel button, sandwiching a thumbwheel that flicks down to set or add speed, and up to resume or reduce speed. The Cruze's gauges are big and crisp, illuminated with ice-blue LED lighting. With the RS appearance package, they're trimmed with chrome and covered with bezels that make them pop even more in darkness. The tachometer is located on the left and the speedometer on the right, with smaller fuel and temperature gauges in the middle. Underneath the smaller gauges, a digital display shows current gear, direction of travel, and a host of options for vehicle or travel information. It's easy to cycle through the choices with a toggle on the turn signal stalk, and just as easy to set preferences for automatic vehicle locking and the like. Again, it's impressive in a compact. The trunk offers plenty of space. With 15 cubic feet of volume, the Cruze trunk matches the best in class, with substantially more room than what's available in the Honda Civic or Toyota Corolla (12.0 and 12.3 cubic feet, respectively). The opening is large, and the trunk lid parks straight up and well out of the way. The Chevrolet Cruze is a product of joint engineering among GM tech centers around the world, and the co-operation shows in the way the Cruze performs. It isn't perfect, but the Cruze moves Chevrolet to the front of the small-car pack. In many respects, particularly measured by interior comfort and overall refinement, the Cruze performs a class above the compact-sedan standard. We can't say that about its engine and transmission performance, however. Cruze's powertrain isn't glaringly weak, but it's not one of the highlights in its dynamics portfolio. The Cruze is available with two four-cylinder engines, and both have most of the latest control, durability and maintenance-reducing features, including fully variable timing for both intake and exhaust valves. The base engine displaces 1.8 liters, producing 138 horsepower and 124 pound-feet of torque. The upgrade engine is actually smaller, at 1.4 liters, but it's equipped with a high-tech integrated turbocharger. The turbo engine generates the same 138 hp. It does produce an additional 24 lb-ft of torque, but that in itself doesn't seem enough to offer a choice. So why the second engine? We're not sure either, but we can guess. The 1.4-liter four generates its power using a bit less fuel. It's one reason the Cruz Eco model is EPA rated at 28 mpg City, 42 Highway, with the manual transmission, and 26/37 mpg with the automatic. Those are the best EPA ratings for any compact with a conventional gasoline engine, and better than most subcompacts. Both transmissions have six forward gears. That's rare in this class, and another contributor to Cruze's overall fuel economy. The 6-speed automatic is technically advanced for a conventional torque-converter automatic in this segment, with GM's ActiveSelect manual-shift feature and a control program that unobtrusively puts it in neutral when the car is idling, even when the gear selector is in Drive. That, too, helps save fuel. Our test cars all had the upgrade (smaller) turbo engine, and overall it does an adequate job in a sedan of the Cruze's size. It's impressively smooth and reasonably quiet, even when it's working very hard, and at 75 mph hour on the freeway, it's only turning about 2800-2900 rpm in top gear. The power comes on fairly low in the rev range, and then evenly all the way to redline. You don't have to wait until it's screaming at 6000 rpm for it to demonstrate any gumption. We'd guess that maybe 80 percent of typical drivers will be satisfied with its performance in daily use. The dissatisfaction comes for that percentage of drivers who more than occasionally like to accelerate full bore, or drive harder than normal commuter-grade travel, and not just because the Cruze is slower than most cars in this class. We'd estimated its 0-60 mph acceleration time in the high 8-second range, and for many drivers that will be just fine, thank you. Our complaint is more about how hard the engine is working in the process, and how you really need to keep it floored to get this car to go. It may also be that, because the Cruze is so well sorted in other respects, it could handle a lot more power. The 6-speed manual transmission works fine, with a firm, smooth, shifter and gear ratios well suited to maximizing the limited power. The automatic, though, has a similar bi-polar character as the engine. It works great when you're going at a relaxed, fairly casual pace, but not so well when you really step on the gas. As a full automatic, the transmission's shifts are positive and impeccably smooth. If you step on the gas just a bit to gain speed around a dawdler, it will shift down one gear smoothly, deliver a moderate bubble of acceleration, and then find top gear again as quickly as it can. But if the road opens up through the countryside, with nice curves that mean slowing fairly hard and then speeding up again, the automatic is less co-operative. Perhaps to maximize fuel economy, Chevrolet engineers seem to have programmed it to always seek the highest gear mechanically possible. The Cruze automatic doesn't like to shift down more than one gear at a time, and it won't unless you floor that gas pedal. And once it does downshift, it's most concerned with getting back up into sixth gear as soon as it can. In such circumstances, the manual-shift feature is the preferred choice, and it works almost surprisingly well. The shifts are quite quick, but still smooth, and the transmission will hold the chosen gear at fairly high rpm. One important way the Cruze surpasses much of its competition is in its tight, ultra-solid body/frame structure. The Cruze unibody has as much extra-high-strength steel in key locations as any car Chevy has built, according to engineers. It has earned the highest scores in government-mandated crash tests in Europe, and Chevy says it expects the same in the United States. More to the point, the solidly built body provides a solid foundation for a lot of good things that make Cruze pleasant to drive. Interior comfort is one of them. Very little vibration finds its way into the Cruze cabin, and it's one of the quietest compacts we've driven, even with its little, hard-working engine. Moreover, the noise passengers do hear is the sort that tends to be less obtrusive, like the crack of tires on pavement seems. There is very little wind noise, and not much of the high-pitch mechanical or vibration buzz that can come across as white noise. The solid body also contributes to excellent ride and handling. Even without a fully independent rear suspension, something that can make cars of this type jittery and prone to bounce in the rear, the Cruze's ride is nearly flawless. It absorbed mid-winter potholes with the aplomb of a luxury sedan, without a lot of bounce-rebound-bounce, or anything close to mushiness or float. In total, this compact leads the pack in ride quality, but it isn't sluggish. It was stormy and cold through most of our time in the Cruze, and that isn't conducive to exploring a car's handling limits, but it's perfect for exploring all-season capability, and here the Cruze was stellar, even with its standard all-season tires. Its lithe, balanced quality helps the Cruze on slippery roads, because if the driver is reasonably smooth, there won't be any squats, dives or side-to-side body swaying that can shift weight, upset traction and make the car harder to manage, as if there were a giant bowling ball rolling around in its shell. The standard traction control takes car of modulating the gas pedal. The driver just steps on it, and the electronics allow the Cruze to accelerate as fast as it can accelerate, given the traction available. The electronic stability control helps the driver stay ahead of the game, and it rarely lets anything get to the point where the Cruze might spin or swap ends. When the pavement dries and the road clears, the Cruze can be good fun to drive, though more so with the manual transmission. Its power-steering pump runs on the electrical system rather than by drawing its power directly from the engine, and it's reasonably well sorted. It requires almost no effort to turn at low speeds, but resistance builds somewhat as speeds increase. The steering is also fairly quick, to the point that a driver might have to correct and re-adjust the car's trajectory through a curve, because the wheel was initially turned too much. Overall, we'd rank the Cruze as a fine handling car. The nicely controlled body motion that helps in sloppy conditions applies on warm, dry pavement as well, at much higher speeds. At a more urgent clip, the Cruze maintains the poise it exhibits in a blizzard, with nothing jerky or surprising in its reactions. And there is quite a bit of lateral grip in the upgrade, low-profile tires, so it holds the pavement nicely though a fast curve. No real complaints about the brakes either. The pedal can seem a bit grabby when first applied, but the driver gets the hang of things in short order. The anti-lock brake system (ABS) manages full-panic stops nicely, and smoother, steadier braking quickly becomes a breeze. The Cruz Eco's outstanding mileage ratings will no doubt appeal to many compact drivers. Though we haven't had a chance to drive one, experience suggests that there will be at least a slight payback for the higher mileage. The Eco's so-called green tires will be harder, less sticky, than those on other models, and that could affect both ride and handling. The Eco may prove at least a bit less responsive than other Cruz models. Perhaps more significantly, the Eco's weight-reducing measures could influence overall performance, and not from the safety perspective. Chevy engineers have trimmed weight from the Eco's body by using thinner steel blanks and fewer, smaller welds in strategic locations. They've probably trimmed some of the sound-insulating material, and all that could affect the Cruze's excellent structure and noise and vibration control. Shoppers are encouraged to drive both the Eco and other Cruze variants before buying. 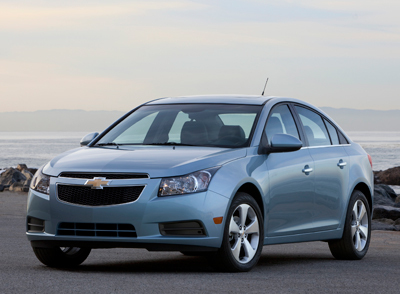 The all-new 2011 Cruze has moved Chevrolet to the top of the ultra-competitive compact sedan segment. Measured by features, mileage and ride-handling balance, or interior noise, space and quality, the Cruze matches or beats the best. It falls off a bit in power or engine performance, and it gets pricey at the high end of the model range. The base Cruze LS or a moderately-equipped LT look quite reasonable, but an LTZ loaded with navigation and premium audio bleeds well into the territory of larger, well-equipped mid-size sedans like the Ford Fusion, Honda Accord, or Chevy's own Malibu. J.P Vettraino filed this report from Detroit. Head/hip/leg room, f: 39.3/53.0/42.3 in. Head/hip/leg room, r: 37.9/52.4/35.4 in. Cargo volume: 15.0 cu. ft.